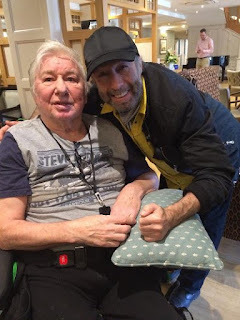 Ralphs had just completed a British tour with Bad Company when it was reported that he had been hospitalized with a stroke. From various reports, it appears that he is still not able to walk but his spirits remain high. A long overdue update on Mick. He is now settled in his care home, and his boys are still very much in attendance. Hes finding the physio very tough, but is trying his very best. He sends his love to all, and thanks each and every one of you that sends Birthday wishes. He had a great day yesterday with Ben and family, and Jim, but was very tired today. He loves to hear how things musical are doing, and news of Bad Co, Ian Hunter, and his Blues Band are very welcome, and brings a smile to his face. Hes determined to get back on his feet again, which is very hard for the visitors to take, but we all stay very positive, and supportive. much love to you all. In mid-May, Paul Rodgers, who had been with Ralphs in Bad Company, posted a picture (above right) of the two of them together, saying "Great to see Mick yesterday doing so well. Sharp as a needle and funny as hell. - Paul". Mick Ralphs was part of Mott the Hoople from 1969 to 1973, going on to co-found Bad Company in 1974 with Paul Rodgers. He also toured with David Gilmour in the mid-80's. Among Ralphs' songwriting credits are Can't Get Enough of Your Love, Feel Like Makin' Love, Movin' On and Oh, Atlanta.